Hey, I redesigned the site! After having the same design through two different content management systems (the second of which I wrote CSS to look like a template on the first), I’ve decided that it was time to give the site a little facelift. Allow more room for images, get rid of a few dated design elements, things like that. And now, if you are a reader of this blog who primarily reads it on your mobile device, you are now being treated to something that desktop readers have been (probably) ignoring for years. That would be the site’s tagline. I kept the same one for the first 5 years or so, until I notice that Josh over at the Whiskey Jug was using essentially the same one (we both started our sites about the same time and came up with it independently). But it is also a great lead in to tonight’s review. I’m straying a little from the whiskey I typically cover tonight to talk about something that is “whiskey adjacent.” I’m taking about beer. And not just any beer, a beer that has been co-branded between Budweiser and Jim Beam. It’s not “barrel-aged” per se. The language that they use in the press release is “aged on Jim Beam bourbon barrel staves.” But some of the flavors of a barrel-aged beer do come through. Overall, it’s a respectable beer. I read somewhere that if it had been released under one of AB-InBev’s “craft” labels that people would be raving about it. I have to agree. This is a good beer and well worth picking up a six-pack to try. But, let’s get onto the more formal review, shall we? Nose: Caramel, a light booziness, and classic Budweiser biscuity notes. Mouth: Sweet with caramel and malt, nutty, a mild booziness. Notes of nuts, cooked rice and oak linger. Thoughts: I’m going to admit something here. I do not hate Budweiser products. Even as a fan of craft beer, Bud Light is my “yard work beer” of choice. At the same time, I tend to dislike barrel-aged beers. They are typically too sweet, too strong, and too heavy for me to want to finish more than a couple sips. This splits the difference between the two. 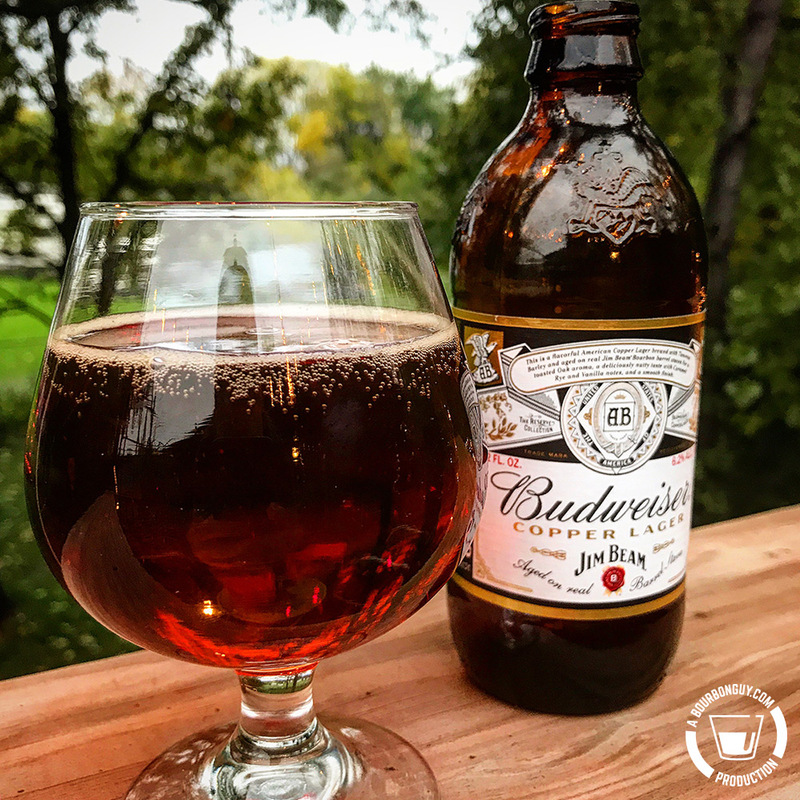 It is lighter than a typical barrel-aged beer but is much more flavorful than a Budweiser, even while retaining some of the Budweiser flavors. This beer just works. I like it. On Untapped I gave it a 3 out of 5, which is what I use when I like something, but am not is a real hurry to buy more when the amount I have is gone. As I said above, it’s worth picking up to give it a try. There is a store in Wisconsin that on certain days, probably get’s more business from Minnesota than it does from locals. I will admit to being one of many Minnesotans who likes buying a beer or whiskey from a store on whichever day I happen to be at it. Unfortunately, many stores in the state of Minnesota don’t feel it is in their best interest to serve their customers on the days the customers want to be served, preferring instead to lobby against changing a law who’s time has long passed it by. See, in Minnesota, it is illegal for a liquor store to be open on Sunday’s regardless of the fact that it is one of the two busiest shopping days of the week. Many liquor stores prefer it that way. Why? you might ask. Well the thought is that they will make as many sales if they are open 6 days a week as if they are open 7 days a week. Plus they won’t have to pay anyone on that seventh day. It doesn’t matter what the customers overwhelmingly want. And sadly, politicians in Minnesota are just like they are everywhere else. People that pay, get the votes in the legislature and those who don’t, get the shaft. Unfortunately for Minnesota, its two largest population centers are also on the border with a state who is more than happy to take the tax dollars on Sunday. There are 4.14 million people in the two largest population centers in Minnesota. There are 5.5 million in the state. And though people might not drive an extra hour to get a beer, many places in the Twin Cities metro are about a half hour apart meaning over 40% of the the population of the state* could conceivably make a run for the border while on regular shopping trips without going very far out of the way. Sending tax dollars out of state. All because some store owners would rather enshrine their dislike of competition in law instead of giving customers what they want. It’s one of the reasons I try to choose places like Ace Spirits who would be open on Sunday if the law would let them. Plus, since I visit family in Wisconsin quite often on Sundays, the purchases I might have made in Minnesota are made at Casanova Liquors in Hudson, just before I hit the border. One of the things I found on a Wisconsin trip this summer was 1776 Brown Ale, aged in Rye Whiskey Barrels. I held it in the closet until the weather was right for a barrel-aged ale and here it is. Purchase Info: Casanova Liquors, Hudson, WI. I didn’t keep a receipt for this one, but it was roughly $10 for a bomber. Details: Brown ale aged in rye whiskey barrels. 10.4% ABV. Brewed and bottled by Georgetown Trading Co., Sterling, VA. Mouth: Sweet caramel layered over typical bready brown ale notes. After a few sips you start tasting the spiciness of the rye. Thoughts: This is sweet, but not as sweet as most barrel aged beers I’ve had. Whether that is due to the use of rye barrels or from a quirk of the aging process, I have no idea. I like the spiciness in the back of the mouth though. If you like barrel-aged beers, certainly check this out. If it were available in Minnesota, I would definitely pick up another bottle…just not on a Sunday. It’s February in Minnesota. It’s cold. It’s snowy. I had the feeling today as I drove to the dog park that I was driving through the photos you see of Northern Canada or Alaska. The ones where you are so far north the trees no longer grow and the towns are just a collection of buildings. The only colors are blue sky and white snow. There’s snow on the road, snow on the buildings, snow on the few plants you can still see peeking out. Six foot piles along the sides of every driveway. The debris from too few snow plows lining roads that are becoming increasingly narrow. I guess they don’t call it Minnesnowta for nothing. But there is good news. There is a cure for the deep-set chill of a Minnesota winter. Beer. Strong, dark beer. Beer that is chocolatey or wine-like. Beer so thick you might be forgiven for thinking that you are actually drinking bread. But, you might be asking yourself, this is a bourbon blog? Well, don’t you worry your pretty little head about that. The result of a barrel only being able to be used once to make bourbon is a lot of used barrels. Just because many of them go to Scotland or Canada to age their fine whiskies, doesn’t mean that all of them leave the country. There is a demand among small brewers for bourbon barrels to help age their beers as well. 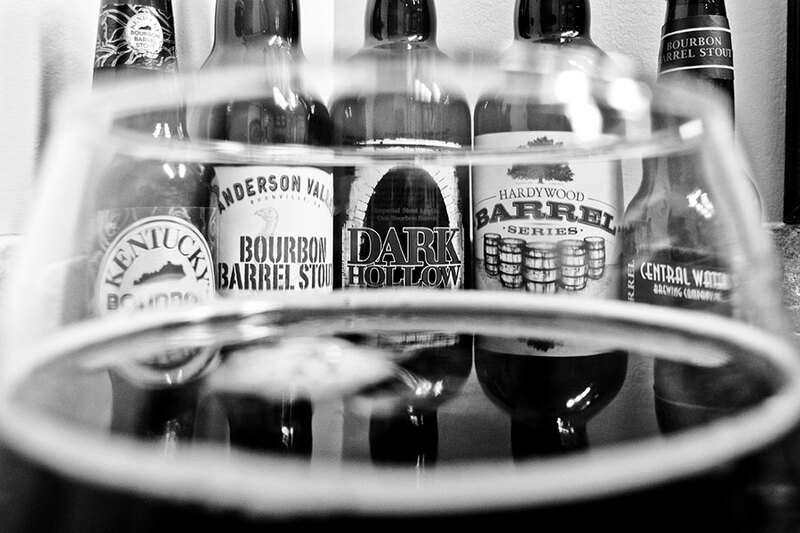 What follows are five beers that have been aged in bourbon barrels. And because it is the dead of winter, and we all need it, each of them are sweet, strong stouts. Each of these were poured in identical tulip shaped glasses and tasted one at a time over the course of a single day. I’m rating them with the 1-5 style rating I used in Untappd when I checked them in. Initial Thoughts: Pours with a thick milk chocolate colored head. Nose: Dark and fruity with wine-like qualities. After a bit that fades to be replaced with chocolatey cereal notes. Mouth: Moderately thick mouthfeel with a good bit of carbonation. Fruity and sweet with a big hit of alcohol flavor. Final Thoughts: I could taste that this was a high ABV beer before I looked at it. The alcohol flavor was that strong. The more I tasted of this, the less I liked it. I don’t know that I would want more than one of these in a session. Nose: Sour. Cooked cereal. Corn chips. Mouth: Thin in the mouth. Nice carbonation. Nicely balanced sweetness and bitterness with hints of coffee and chocolate. Final Thoughts: Balanced. Not heavy. Unlike many stouts, I could drink more than one of these in a session. Being a higher ABV beer, this is dangerously drinkable. Initial Thoughts: Pours with a nice thick head. Mouth: Acidic. It bubbles and froths in the mouth as if it’s making more head on your tongue. finishes with acid bitterness and malt. 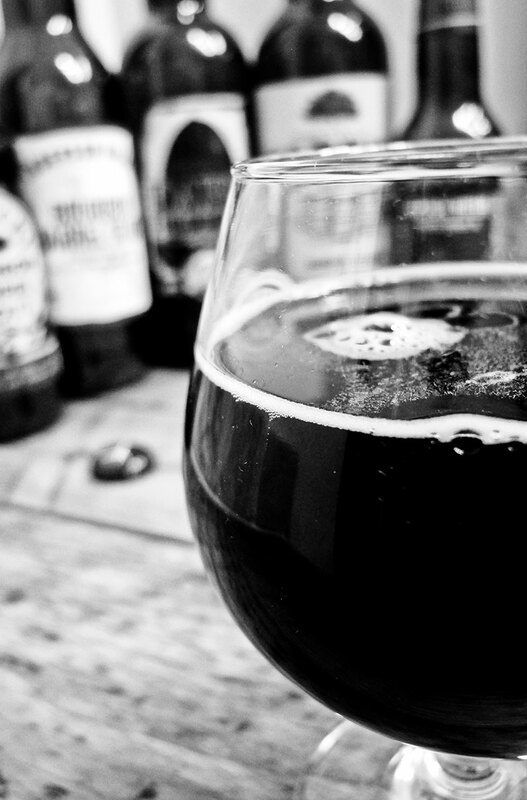 Final Thoughts: This barrel-aged stout is more acidic than most, almost a sour. I think this would be more refreshing on a hot summer day than most stouts due to that. Initial Thoughts: Looks thick on pouring. Nose: Sweet maltiness that fades quickly. Chocolate. Mouth: Thick. Initially chocolatey. Finishes wine-like with an alcohol sharpness. Final Thoughts: This proves that aging doesn’t always work . This doesn’t taste aged, it tastes old. I’d like to try the non-barrel aged version of this to see how it compares. Initial Thoughts: Pours with zero head. Nose: Cereal maltiness initially. After sitting a bit: dark fruit. Mouth:Nice and thick with very little carbonation. Sweet fruit balances bitterness with a hint of smoke. Beer is an amazingly adaptable drink. It is highly influenced by your glassware and what you serve it with. Wine flavors when imbibed on its own might give way to chocolate flavors when served with food. The Central Waters one did that with pizza after the tasting was done. If you just take a sip, you might like it better than if you are spending time with it. The Hardywood did that for me as I tried to finalize my rankings. Ultimately what you like is highly influenced by how, where and with whom you drink it. On a cold, snowy night in Minnesota, all of these are good enough to warm you up. Holy Crap! I hate canker sores! They hurt when you talk, when you smile and, yes, when you drink bourbon. I've been living with them for two weeks now. It's been two weeks with no bourbon to speak of. And with no bourbon in my life for the last two weeks, you might imagine that I'd be sad. That there would be tears and despair. You'd might imagine that, but you'd be wrong. You'd be wrong because while you can't have bourbon with a mouth sore, you can have beer. And on most nights beer is a nice consolation for no bourbon. So what, you might be asking, does any of that have to do with a bourbon blog? A couple years ago, I was made aware of an amazing phenomenon happening in the world of beer. Namely the aging of beer in used bourbon barrels. I've had a few of these. Stouts, IPAs and others, but one of my favorites was one I didn't realize was barrel aged, the first time I had it. I had asked for a good beer (surprise me) at a local burger place known for their beer selection and what was brought to me was Dragon's Milk from New Holland brewery. I loved it from the first sip, but knew nothing about it. It wasn't until much later that I learned it was barrel aged. 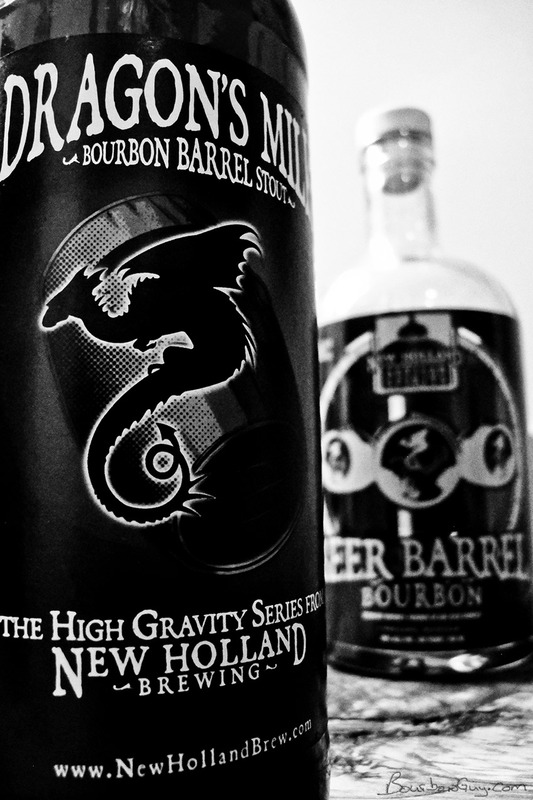 Imagine my delight when I learned that New Holland was releasing a bourbon that had been finished in Dragon's Milk barrels. That's right, they were releasing a bourbon barrel aged beer barrel aged bourbon. The very concept is hard to keep straight. But the real question is how does it taste? And does it live up to it's amazing sibling? Let's find out. Nose: Initially a lot of alcohol. After sitting a bit it settles into maple syrup and a hint of oak. Taste: First sip is nutty and malty. Reminds me of Grape-Nuts cereal. Beyond that, the bourbon is soft and creamy with some oak and some tannins. Finish: This was odd. You swollow and your mouth tingles. Nothing strange so far. But then after a few seconds a burn comes up from your stomach and settles over your heart. Not painful, just warm. At that point the tingle has faded and there is a lingering sweetness in the mouth. Taste: Nutty and malty Grape-Nut flavor with some fruitiness tossed in for good measure. Overall: I love this beer. It is sweet without being cloying. It's interesting but also downright tasty. I would drink the heck out of this (and also have). The bourbon is interesting. There is certainly a resemblance between the two. That nutty-malty Grape-Nut flavor is present in both. 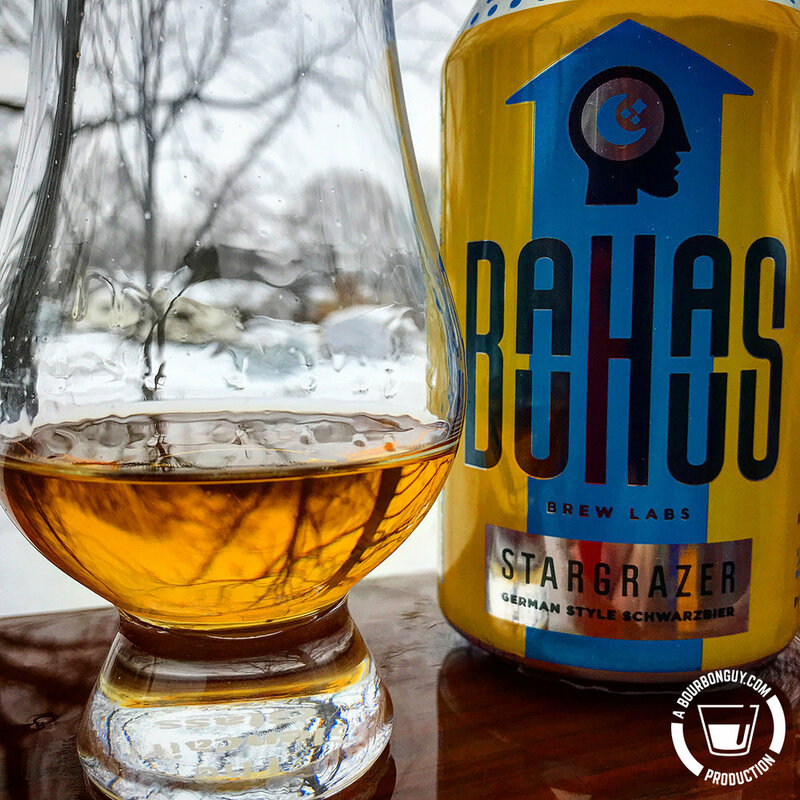 If you love the beer, you owe it to yourself to try the bourbon. With it's creamy nuttiness, it makes a nice-change-of-pace bourbon. That said, if you are not a fan of this beer, do not buy this bourbon. I happen to love the beer and as such, I like the bourbon.